The genetic factors are determinants in required dosage changes of warfarin among which are polymorphisms of CYP2C9 and VKORC1 genes. The present study aimed to determine the allele and genotype frequency of CYP2C9 and VKORC1 genes in Birjand population. This study was conducted on 120 individuals who referred to Imam Reza and Vali-Asr hospitals for PT/INR test. After extracting the genomic DNA, the considered sequences were amplified by PCR, and restriction fragment length polymorphism analysis was done by AvaII and KpnI enzymes to determine allele polymorphisms. Moreover, related sequences of VKORC1, after amplification, were sequenced for determining the genotype. Allelic and genotypic frequencies as well as Hardy-Weinberg equilibrium, observed heterozygosity, expected heterozygosity, and polymorphism information content were calculated by PowerMarker V 3.25 software. Amongst 120 individuals in this study with the mean age of 58.12 ± 12.7 years, 80.8%, 9.1%, and 10% exhibited the alleles of 1, 2, and 3 CYP2C9 gene, respectively. The genotype frequencies of 1/1, 1/2, 2/2, 3/1, 3/2, and 3/3 of this gene were found to be 64.1, 15.8, 0, 17.5, 2.5, and 0 %, respectively. In -1639 G>A region, VKORC1 had normal homozygote genotype (GG) and in 1173 C>T region, heterozygote (CT) with the frequency of 48.7% and 45.9% had the most prevalence. Compared with other populations, there is a considerable difference between the allele frequency of CYP2C9 and VKORC1 genetic variance. Since 35.8% of the selected populations carry an abnormal allele causing sensitivity to warfarin, the specialists at medical centers must be informed about the genotypes of patients before prescribing warfarin. Coumarin-based drugs prevent the production of vitamin K-dependent coagulation factors and thereby reduce the risk of blood clots formation . Warfarin is the main member of coumarin family and is the most prescribed oral anticoagulant drug across the world ,,. Studies show that one patient out of every 100 patients taking warfarin encounters fatal bleeding annually  and up to 15% of patients experience mild bleeding . Therefore, physicians use international normalized ratio (INR) to adjust the medication in order to put prothrombin time (PT) in the proper range for the patient ,,,,. Because of individual differences such as age, diet, smoking, weight, and genetic differences, the required dose of anticoagulant is not the same for different patients ,,. According to Food and Drug Administration (FDA), pharmacogenetics testing for dosage adjustment is necessary for warfarin treatment ,..
Of pharmacogenetic factors affecting the diversity of the required dose of warfarin, polymorphism, a subunit gene of VKORC1 [MIM608547] producer (Vitamin K epoxide reductase complex subunit 1) is considered as a pharmacodynamics and polymorphisms of cytochrome CYP2C9 [MIM601130] and regarded as pharmacokinetic factors . Six single nucleotide polymorphisms (SNPs) which influence the activity of CYP2C9 gene have been identified of which CYP2C9*1 represents the normal allele. However, the allele CYP2C9*2 (rs1799853) is caused by changing Arg-144-Cys in exon 3 and allele CYP2C9*3 (rs1057910) by changing in Ile-359-Leu in exon 7 of this gene ,. Generally, about 40% of the diversity in warfarin dose is due to the changes in genes involved in the metabolism of warfarin. For instance, polymorphism in CYP2C9 gene is responsible for 5-22% variations in response to warfarin in different individuals ,. Besides, in Iran, European and American countries, the variants of CYP2C9*2/*3 have shown the greatest effect on CYP2C9 enzyme activity ,,. Also, studies of VKORC1 gene with 6-37%, responsible for the diversity in response to warfarin in different individuals, have shown that two SNPs affect warfarin oral dose of - 1639 G>A (rs9923231) and 1173 C>T (rs9934438) ,. Polymorphism -1639 G>A in promoter and 1173 C>T in intron of a VKORC1 gene, by reducing expression of this gene, reduce the required dosage and warfarin sensitivity ,. In ethnographic studies, ethnicity is also an important factor in maintenance dose and warfarin sensitivity such that Asians have high sensitivity and African-Americans have less sensitivity to coumarin drugs . This study aimed to determine the prevalence of alleles of *1,*2, and *3 of CYP2C9 gene and polymorphisms of -1639 G>A and 1137 C>T of VKORC1 in Birjand population in order to both determine the prevalence rate of the mentioned genetic variants in the region and represent the practical value of the test. In order to determine the allele and genotype frequencies of CYP2C9 and VKORC1 in this study, citrated blood samples of 120 patients referring to Imam Reza and Vali-Asr hospitals of Birjand city, during the first 6 months of the year 2015 (end of March to end of December) with the request for PT and INR tests were used. The study protocol was approved by the Ethics Committee of the Birjand University of Medical Sciences (code No. Ir.bums.1394.89). First, by salting out of 2 mL citrated blood, the genomic DNA of the samples was extracted in the laboratory of Birjand University of Medical Sciences. The concentration of purified DNA samples of each individual were evaluated by Nanodrop Specterophotometer Bio Tek, USA EPOCH, and samples with appropriate concentration and optical density were selected for the next stages. To analyse the alleles of CYP2C9*2 (rs1799853) and CYP2C9*3 (rs1057910) in exon of 3 and 7 of CYP2C9 gene and to determine the frequency of polymorphisms of -1639 G>A (rs9923231) promoter and 1173 C>T (rs9934438) in intron of a VKORC1 gene, the primers were designed by Primer 3 Software. After the blast and confirmation by the National Center for Biotechnology Information (NCBI), they were sent for the synthesis to South Korea, Bioneer. The sequences of primers used in this study are shown in [Table 1]. After the synthesis, sequencing primers were amplified by thermocycler machine (Eppendorf AG.22331, Hamburg, Germany, No. 5345-015844) in the laboratory of Birjand University of Medical Sciences with the following applications. Table 1: Master Mix compositions in this study. Temperature programs for manipulating the reactions of two alleles of CYP2C9*2 and CYP2C9*3 are as follows: CYP2C9*2: 95 °C for 2 min followed by 32 cycles (95 °C for 60 s), 62 °C to 30 s, and 72 °C for 1 min and the final extension was performed at 72 °C for 2 min. CYP2C9*3: 95 °C for 5 min followed by 35 cycles (95 °C for 15 s), 65 °C in 20 s, and 72 °C for 30 s and the final extension time was done at 72 °C for 2 min. Master Mix compositions in this study are shown in [Table 2]. Table 2: Sequence of primers used in this study. In order to confirm the amplification of the regarded fragment and non-amplification of other regions and the formation of primer dimer, the PCR products on a 1.5% agarose gel were electrophoresed besides the size markers of 50 bp. Afterwards, the gel affected by UV light was imaged by Gel Documentation Machine (UVITEC CAMBRIDGE, United Kingdome). The products obtained by PCR were cut under the enzymes AvaII (Jena Biosience, Cat. No EN-119-csTM) and KpnI (Sinaclon Bioscience, Cat.No PR 911710). [Table 3] shows the cutting and the fragments after the restriction fragment length polymorphism (RFLP) analysis. Table 3: Cutting region and digested fragments after RFLP affecting by AvaII and KpnI enzymes. Controlled PCR product (10 μL) was combined with 18 mL of distilled water along with 2 mL buffer R (or buffer Kpn) and 1 μL of AvaII and KpnI enzymes. This compound was then incubated at 37 °C for 5 h and the obtained cutting product was electrophoresed on 3% agarose. After imaging the gel, the obtained pattern was examined. To determine the frequency of polymorphisms -1639 G>A promoter and 1173 C>T in intron of a VKORC1 gene, at first, the respective sequences were amplified by both synthesized primers and thermocycler instruments with the following temperature program: 94 °C for 5 min followed by 35 cycles (95 °C for 30 s), annealing temperature 60 °C in 20 s, 72 °C for 30 s and final extension time was performed at 72 °C for 2 min. After the electrophoresis of PCR products on 1.5% agarose gel and making certain about using correct and specific polymerase chain reaction, the samples were sent to Kowsar Biotech Company (Iran) for sequencing. The raw results of sequencing the samples were examined with the help of appropriate ChromasLite 2.1.1 Software. Available possible variants of VKORC1 gene were identified after alignment and data analysis. Finally allelic and genotypic frequencies as well as Hardy-Weinberg equilibrium (HWE), observed heterozygosity (Ho), expected heterozygosity (He), minor allele frequencies (MAF) and polymorphism information content (PIC) were calculated by PowerMarkerV 3.25 Software. The results show that from among the 120 patients, 62 individuals were men (51.6%) and 58 women (48.3%) whose age means were 58.12 ± 12.7 years respectively. The mean intake time of warfarin in patients was 6 ± 2 months whereby the patients reached relatively stable INR. Among the population, 76.2% were from Imam Reza hospital and 23.8% from Vali-Asr hospital. The results of the allele variants of CYP2C9*2 and CYP2C9*3, after applying PCR and RFLP, are shown in [Figure 1] and [Figure 2]. 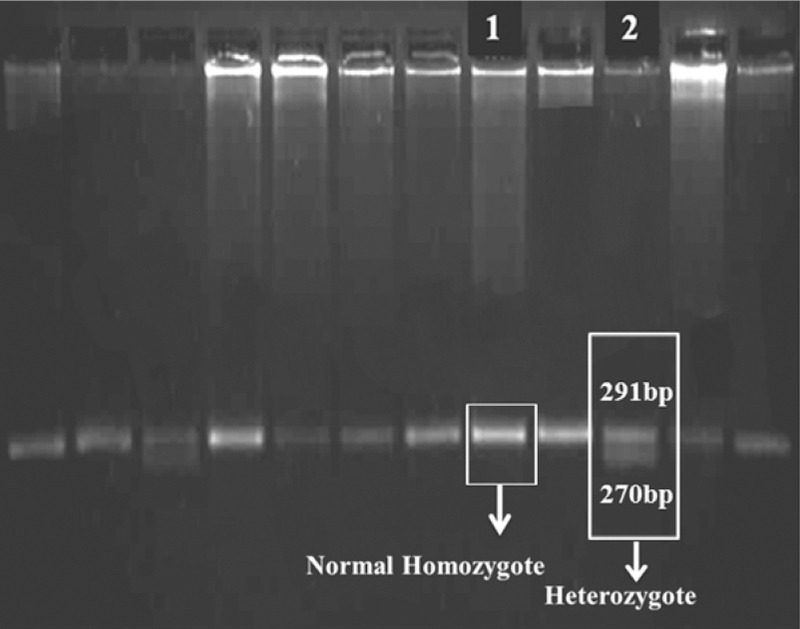 Figure 1: The image of the gel and produced bands with AvaII enzyme. Raw 1, marker 50bp; Raw 2 and 4, normal homozygote CYP2C9*2; Raw 3, heterozygote CYP2C9*2. Figure 2: KpnI enzyme. Raw1, normal homozygote CYP2C9*3;Raw 2, heterozygote CYP2C9*3. Normal genotype of CYP2C9*1/*1 shows that the individuals did not exhibit any kind of mutation for CYP2C9*2 and CYP2C9*3 alleles which indicates the presence of CYP2C9*1 allele. Genotype of CYP2C9*1/*2 allele includes those whose CYP2C9*3 is wild type but have mutant heterozygote for CYP2C9*2. Individuals with CYP2C9*3 allele and mutant heterozygote of CYP2C9*2 have 2/2 genotype, and individuals with wild type CYP2C9*2 allele and mutant heterozygote CYP2C9*3 have 1/3 genotype. Genotype of 3/3 and 3.2(“/” means division and heterozygote) are reported in individuals with wild type CYP2C9*2 and mutant homozygote of CYP2C9*3, respectively, and for CYP2C9*2 and CYP2C9*3 alleles are both reported as mutant heterozygote. The method of determining the genotypes of CYP2C9 gene by enzymes with limited effect used in this study is presented in [Table 4]. Table 4: Determining CYP2C9 genotype by AvaII and KpnI enzymes. The allele frequency of CYP2C9*2 was 9.1% in the studied population. After RFLP analysis, CYP2C9*2 allele, normal homozygote genotypes, and heterozygote showed the frequency of 83.3%, 16.6%, and 0%, respectively, and the frequencies in terms of gender were 84.7 %, 15.3%, and 0% in men and 75.9%, 24.1%, and 0% in women .The allele frequency of CYP2C9*3 in the sample was 10%. As for CYP2C9*3 allele, normal homozygote and heterozygote genotypes were found to be 82.8% and 17.5%, respectively. The allele frequencies of these genotypes were 85.55% and 11.3% in men and 76.7% and 23.3% in women. For CYP2C9*3 allele, no mutant homozygote was observed in the individuals. The genotype frequency of CYP2C9 gene is shown in [Table 5]. Heterozygosity, Hardy-Weinberg equilibrium and minor allele frequencies and their frequencies for the three polymorphisms tested are given in [Table 6]. Allele frequencies of all the markers were in HWE (P > 0.05). Table 5: Genotype frequency of CYP2C9 gene in the present study. Table 6: Heterozygosity, Hardy-weinberg equilibrium, polymorphism information content, and allele frequencies. Among the 120 individuals in this study, CYP2C9*1/*1 genotypes has the highest prevalence with a frequency of 64.1%, and genotypes have the lowest frequency of 2/2 and 2/3 with 0%. Finally, the normal allele of CYP2C9*1 in both genders showed highest presence with the frequency of 83.3%, while the two alleles of *3, *2 with respective frequencies of 10% and 9.1% had the lowest prevalence. Overall, 35.8% of the participants had an abnormal allele. Despite differences in allele frequencies in the two genders, the differences were not statistically significant. After PCR and sequencing -1639 G>A region of VKORC1 gene (g.8853 G>A), genotype distribution of the current population showed that there was normal homozygote (GG) with a frequency of 48.7% in 55 individuals, heterozygote (AG) with a frequency of 38.9% in 44 individuals, and mutant homozygote (AA) with a frequency of 12.4% in 14 individuals. Moreover, in terms of gender, statistics for normal homozygote genotype, heterozygote and mutant homozygote of men in -1639 G>A region were 40.3%, 30.5%, 17.5%, respectively and in women, 50%, 36.7%, and 5%, respectively. Allele frequency of-1639 A and allele of -1639 G in the population are 31.9% and 68.1%, respectively. Some electropherogram images of -1639 regions are shown in [Figure 3]A. Amplification and sequencing of VKORC1 gene with the related primer of -1639 G>A region of its promoter, showed two novel mutations in this region which include g.3660 G>A heterozygote mutation in 3 individuals (1 man and 2 women) with a frequency of 2.7% and g. 3565 G>T heterozygote mutation in one woman with the frequency of 0.9% in the whole population. Figure 3: Electropherogram images of heterozygote genotype of (A) VKORC1 gene, and (B) 1173T region of VKORC1 gene. Further, the results of PCR and sequencing of 1173 C>T region of VKORC1 gene showed that in this population heterozygote genotypes (CT), normal homozygote (CC), and mutant homozygote (TT), as for gender, had the frequencies of 52.6%, 40.4%, 7% in woman and 38.9%, 38.9%, and 22.2% in men, respectively. Allele and genotype frequency of VKORC1 gene is shown in [Table 7]. Electropherogram image of 1173 C>T region is shown in [Figure 3]B. Table 7: Allele and genotype distribution of individuals' VKORC1 gene. This study shows the prevalence of 9.1% and 10% of variant alleles of CYP2C9*2 and CYP2C9*3 in Birjand population. Comparison of genotype frequencies of CYP2C9 gene in this study showed that the majority of individuals have CYP2C9*1/*1 genotype with the frequency of 64.1%. Also, CYP2C9*2/*2 and CYP2C9*3/*3 genotypes in this population had no frequency. Amongst 120 individuals studied for -1639 G>A region of VKORC1 gene, normal homozygote with a frequency of 48.7% in 55 individuals had the highest prevalence and mutant homozygote genotype had the lowest prevalence with 12.4% frequency. Furthermore, heterozygote genotype of 1173 C>T region of VKORC1 gene with a frequency of 45.9% in 53 individuals was dominant and showed mutant homozygote with 14.4% frequency. The presence of allele variants of CYP2C9*2 and CYP2C9*3, -163 9A, VKORC1, and allele of 1173 T of VKORC1 gene, as the cause of the patients’ sensitivity to warfarin, indicates that the formula to determine the daily dose of warfarin in which the genetic variants of CYP2C9 and VKORC1 are significant is imperative and crucial variables can be clinically implemented with greater certainty ,,,. Warfarin dose (mg/day) = [0.628 - 0.0135 × (Age) - 0.24 × (CYP2C9*2) - 0.37 × (CYP2C9*3) - 0.241 χ (VKORC1) + 0.0162 × (height)]2 . (Wild type, heterozygous and homozygous genotypes of CYP2C9*2 and *3 were coded as 0, 1, and 2, respectively, while that of VKORC1 were coded as 1, 2, and 3, respectively). Geographically, Iran is located between both European and Asian populations. Thus, the diversity of ethnic and genetic variants in Iran as a result of migration and population flows seems probable. Thus, access to distribution patterns of genetic variants in different parts of Iran with regard to the effect on the sensitivity to warfarin dose is of great importance. In Shiraz city, Azarpira, et al. determined the presence of normal allele of CYP2C9*1 about 64.88% and allele variants of CYP2C9*2 and CYP2C9*3 with the frequencies of 25.3% and 9.8%, respectively . Contrary to Shiraz, variant of allele CYP2C9*3 (with a frequency of 10%) in Birjand population is higher than CYP2C9*2 allele (9.1%). In addition, genotype frequency of CYP2C9*2/*2 in Birjand population was zero compared to Shiraz population which was 1.37%. ,,. Tabatabae, et al. reported that 200 patients with cardiovascular diseases from northwest of Iran which includes Azari population showed frequencies of 69% and 1% for CYP2C9*1/*1 and CYP2C9*2/*2 genotypes, respectively. CYP2C9*3/*3 genotype in this population was zero but genotype frequency of CYP2C9*2/*2 in Azari population was reported to be 1% . In northwest of Iran, similar to Shiraz population, CYP2C9*2 allele appeared to be the most prevalent allele with 31.3% frequency. In another study by Zand, et al. conducted on 200 healthy Iranians, showed that the prevalence of CYP2C9*1, CYP2C9*2, and CYP2C9*3 alleles were 87.2%, 12.7%, and 0%, respectively . Therefore, the population of Birjand city is different from northwestern and southern populations of Iran in terms of genetic frequency variant of CYP2C9. The allele frequency of CYP2C9*3 is lower in Birjand as compared to Shiraz (9.8%) and northwest of Iran (zero). In contrast to Birjand population, most of the individuals in Shiraz and northwest of Iran showed more variant allele of CYP2C9*2 (25.3% and 31%, respectively) ,. These differences can be attributed to their ethnic background. In 2011, in a study conducted on 111 Russian patients with thrombosis showed that the prevalence of CYP2C9*1/*1 genotype was 84.7%. For heterozygote genotypes, frequencies of CYP2C9*1/*2 and CYP2C9*1/*3, were reported to be 4.5% and 10.8%, respectively. However, no genotypes of *2/*2 and *3/*3 was observed which is in agreement with the findings of our study . Allele frequency of CYP2C9*2 and CYP2C9*3 in Birjand population, compared with Korea, Japan, China, France, Germany, and Brazil populations, showed a considerable difference. In Korea, by analyzing 574 individuals, allele frequency of CYP2C9*2 and CYP2C9*3 were found to be 0% and 1.1%, respectively ; allele frequency of CYP2C9*2 in 147 Japanese individuals was zero, and allele of 3 was about 0.7% . There was no allele frequency of CYP2C9*2 in 130 Chinese patients, but allele frequency of *3 was about 12.2% . In France, in a population of 151 individuals, allele frequencies of CYP2C9*2 and CYP2C9*3 were about 15% and 8%, respectively . In Germany, analysis of 118 individuals showed that the allele frequencies of CYP2C9*2 and CYP2C9*3 were 14% and 5% and in 780 Brazilian individuals, allele frequencies were 12.4% and 5.6% ,. There was a kind of similarity of allele frequency of CYP2C9*2 and CYP2C9*3 between Birjand and 499 Turkish individuals. Both populations had similar allele frequency of *3 (about 10%); however, allele frequency of CYP2C9*2 in the Turkish population was greater than in Birjand population . Krajcíová, et al. analyzed 112 healthy Slovak individuals and concluded that for CYP2C9*2 allele in that population, the frequencies for normal homozygote, genotypes (CC), and mutant homozygote (TT) were 81%, 17%, and 2%, respectively. Also, for allele of CYP2C9*3, the percentage of frequencies of normal homozygote, mutant heterozygote and homozygote were 58%, 15% and 0%, respectively . Kamal El-Din, et al. reported 8.5% and 12% allele frequency for CYP2C9*2 and CYP2C9*3 in 41 children in Egypt. The results of CYP2C9 alleles in Egypt correlate with the results of this study suggesting that the highest presence of variant allele in Birjand population is also related to CYP2C9*3 allele . By enlarging the scope of studies, it turns out that VKORC1 gene also has an important role in ethnic differences in terms of sensitivity to warfarin , and polymorphisms of -1639 G>Aand 1173 C>T region of this gene have significant roles in interpersonal changes in response to warfarin . Salehifar, et al., examined 29 patients in Mazandaran in order to analyze their polymorphisms of -1639 G>A and 1173 C>T of VKORC1 gene. Finally, for -1639 region, the individuals showed mutant homozygote genotype (AA) with allele frequency of 86.2%. Genotypes of AG and GG had the same frequency of 6.9%. In analyzing 1173 C>T intron of one VKORC1 gene, 26 individuals had 89.7% mutant homozygote genotype (TT), 6.9% had normal homozygote genotype, and 3.4% had heterozygote . In this study, contrary to Mazandaran population, normal homozygote genotype and heterozygote for - 1639 region was 48.7% and 38.9%, respectively which were the highest prevalence, and individuals with mutant homozygote encompassed a small percentage of the population which is 12.4%. By studying 150 individuals of Shiraz population in 2010, frequency genotype of - 1639 G>A was 57.14% and -1639 AA genotype was about %73 which shows that, similar to Mazandaran population, mutant homozygote genotype is more prevalent . Moreover, allele of 1173T of VKORC1 gene in this study showed the frequency of 56% while for Birjand population it was 37.4%. Accordingly, sensitivity to warfarin in Shiraz population like Mazandaran population is more than Birjand population. Therefore, the need for a daily dose of warfarin will presumably be lower for Shiraz and Mazandaran populations. By studying the frequency of polymorphism of -1639 G>A of VKORC1 gene in 200 individuals of northwestern of Iran in 2012 (East and West Azerbaijan provinces and Ardabil), the prevalence of mutation in this region was observed. Genotype frequency of normal homozygote, heterozygote, and mutant homozygote of -1639 G>A in these regions were 21.6%, 53.7%, 24.5% in women and 6.3%, 60.22%, and 17.02% in men, respectively . By analyzing genetic variants of VKORC1 for -1639 G>A region in 112 healthy Slovak individuals, Krajcíová, et al. reported the presence of GG, GA, and AA genotypes with the percentage of 73%, 52%, and 12% . It is worth noting that the observed percentage of genotypic frequencies in 1173 C>T of VKORC1 gene of Slovak population is exactly the same as -1639 G>A region. In a study which has been conducted on 148 healthy Greek-Cypriots in 2014, allele frequency of CYP2C9*2, CYP2C9*3, and - 1639 A of VKORC1 were found to be 16.2%, 11.2%, and 53%, respectively. The percentage of allele frequency of CYP2C9*3 in Cyprus population is somehow in accordance with the present study. Nonetheless, the prevalence of CYP2C9*2 allele in this population is more than *3 allele, contrary to Birjand population. Similar to Mazandaran and Shiraz population, Cyprus population has a higher frequency of - 1639 A of VKORC1, all more than that of Birjand population . In another study conducted on 557 English patients in 2012, it was observed that the individuals with genotype AA pertaining to - 1639 G>A of VKORC1 gene who had a frequency of 14.5% required a lower dose of warfarin in order to achieve the targeted INR, where they had more bleeding and therefore, more sensitivity to warfarin. Comparing these findings with those reported from Iran indicates a lower prevalence of this genotype (-1639 AA) in this European population, similar to Birjand population, but higher prevalence in Mazandaran population (86.2%) and northwestern of Iran (21%) . Therefore, the individuals of Mazandaran population followed by northwestern of Iran are more sensitive to warfarin than the English population and are at risk of more bleeding. However, individuals of Birjand population with12.4% frequency of AA-1638 genotype, compared to other three populations, have a lower sensitivity to warfarin. As a result, because of the frequency of polymorphisms in -1639 G>A region of VKORC1 gene, our population is similar to many far populations and different from closer populations. Genotype -1639 AA in Birjand population has the frequency of 12.4% which is different from Mazandaran with 86.2% , Shiraz 55.6% , northwestern of Iran 21% , Chinese 69% , Cyprus 53% , and Argentina populations 20% . But it bears close similarity to Slovak population with 12%  and England with 14.5% frequencies . These findings confirm that -1639 A allele has dominance in Asia with a prevalence of 90% . However, due to the fact that in Birjand population, the results are completely different and most of the individuals have -1639 G allele; therefore, the difference among ethnic peoples in the same geographic region must be considered. In a study conducted on 93 individuals in Japan in 2007, the allele frequency of 1173 T of VKORC1 gene is about 11.3%. This finding resembles the percentage of allele frequency in China (12.8%) found in a study conducted on 133 individuals in 2010 ,. Since the prevalence of this allele in our 120 individuals is much higher than the two populations in East Asia, i.e., 37.4%, therefore, compared with Chinese and Japanese populations, people in Birjand are at a higher risk of bleeding and warfarin sensitivity. Variant allele frequency of this gene in some of the European and Asian countries are more similar to our results. For instance, Bodin, et al. analyzed 222 individuals in France among which 42% had allele of 1173 T of VKORC1 gene . This allele frequency in Slovak population was reported as 50.5% ,. Furthermore, Kamal El-Din, et al. reported the allele frequencies of 1173T of VKORC1 gene and -1639 A of VKORC1 gene in 41 Egyptian children as 52% and 54%, respectively. Thus, allele of 1173 T VKORC1 gene has a higher frequency in these European and Asian populations than Birjand population. Meanwhile, in 2013, genotype of 1173 C>T of VKORC1 gene of 103 Indian individuals were determined; normal homozygote genotype, heterozygote and mutant homozygote were 76%, 22%, and 2%, respectively . The comparison of the frequency of genetic variants of CYP2C9 and VKORC1 in this study with results from other parts of the world confirms that by moving from East to West Asia, the number of carriers of alleles of CYP2C9*2 and CYP2C9*3, unlike -1639 A VKORC1, is increasing. However, in terms of distribution pattern, in countries such as Iran, Oman, India, and Russia, an extreme and unbalanced diversity of CYP2C9 and VKORC1 genotype and allele can be observed . This study was supported by the Department of Research and Technology of the Birjand University of Medical Sciences under project No. 1006. We also appreciate the cooperation of Chancellery for Research and Technology of Birjand University of Medical Sciences. Nahar R, Deb R, Saxena R, Puri RD, Verma IC. Variability in CYP2C9 allele frequency: a pilot study of its predicted impact on warfarin response among healthy South and North Indians. Pharmacol Rep. 2013;65(1):187-194. FDA news release: FDA approves updated warfarin (coumadin) prescribing information new genetic information may help providers improve initial dosing estimates of the anticoagulant for individual patients. Available from: http://www.fda.gov/NewsEvents/%20Newsroom/PressAnnouncements/ 2007/ucm108967.htm. Krajcíová E, Petrovic R, Déziová E, Chandoga J, Turcáni P. Frequency of selected single nucleotide polymorphisms influencing the warfarin pharmacogenetics in Slovak population. Eur J Haematol. 2014;93(4):320-328. Landefeld CS, Beyth RJ. Anticoagulant-related bleeding: clinical epidemiology, prediction, and prevention. Am J Med. 1993;95(3):315-328.
International Warfarin Pharmacogenetics Consortium, Klein TE, Altman RB, Eriksson N, Gage BF, Kimmel SE, et al. Estimation of the warfarin dose with clinical and pharmacogenetic data. N Engl J Med. 2009;360(8):753-764. Tamura T, Katsuda N, Hamajima N. A PCR method for VKORC1 G-1639A and CYP2C9 A1075C genotyping useful to warfarin therapy among Japanese. Springerplus. 2014;3:499: Doi: 10.1186/2193-1801-3-499. Castelan-Martinez OD, Hoyo-Vadillo C, SandovalGarcia E, Sandoval-Ramirez L, Gonzalez-Ibarra M, Solano-Solano G, et al. Allele frequency distribution of CYP2C92 and CYP2C93 polymorphisms in six Mexican populations. Gene. 2013;523(2):167-172. Rathore SS, Agarwal SK, Pande S, Singh SK, Mittal T, Mittal B. CYP4F2 1347 G > A & GGCX12970 C > G polymorphisms: frequency in north Indians & their effect on dosing of acenocoumarol oral anticoagulant. Indian J Med Res. 2014;139(4):572- 578. Park SM, Lee JK, Chun SI, Lee HI, Kwon SU, Kang DW, et al. VKORC1 and CYP2C9 genotype variations in relation to warfarin dosing in Korean stroke patients. J Stroke. 2013;15(2):115-121. Emadian Razavi F, Zarban A, Hajipoor F, Anani Sarab Gh, Naseri M. Allele and genotype frequencies of VKORC1 in Birjand population. Ir J Physiol Pharmacol. 2015;1(3):194-203. Gage BF, Eby C, Milligan PE, Banet GA, Duncan JR, McLeod HL. Use of pharmacogenetics and clinical factors to predict the maintenance dose of warfarin.Thromb Haemost. 2004;91(1):87-94. Johnson JA, Gong L, Whirl-Carrillo M, Gage BF, Scott SA, Stein CM, et al. Clinical pharmacogenetics implementation consortium guidelines for CYP2C9 and VKORC1 genotypes and warfarin dosing. Clin Pharmacol Ther. 2011;90(4):625-629. Taube J, Halsall D, Baglin T. Influence of cytochrome P-450 CYP2C9 polymorphisms on warfarin sensitivity and risk of over-anticoagulation in patients on long-term treatment. Blood. 2000;96(5):1816-1819. Natarajan S, Ponde CK, Rajani RM, Jijina F, Gursahani R, Dhairyawan PP, et al. Effect of CYP2C9 and VKORC1 genetic variations on warfarin dose requirements in Indian patients. Pharmacol Rep. 2013;65(5):1375-1382. 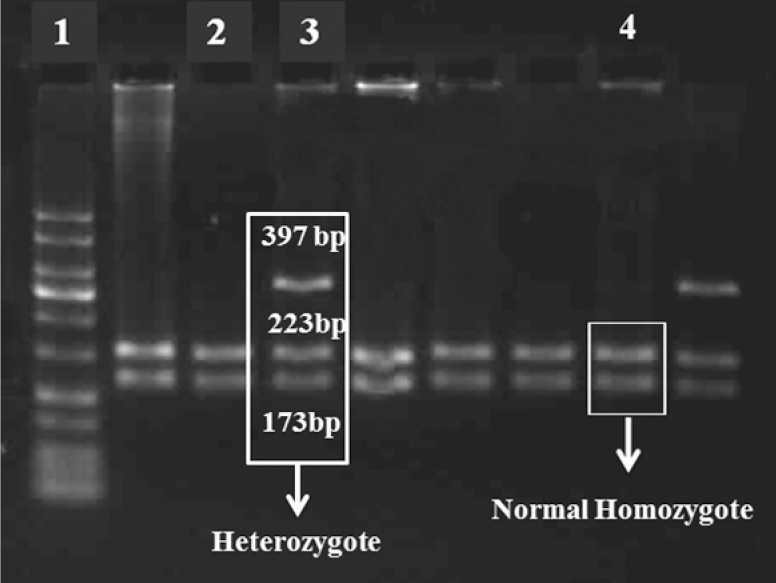 Azarpira N, Namazi S, Hendijani F, Banan M, Darai M. Investigation of allele and genotype frequencies of CYP2C9, CYP2C19 and VKORC1 in Iran. Pharmacol Rep. 2010;62(4):740-746. Kamal El-Din MA, Farhan MS, El Shiha RI, El- Kaffas RM, Mousa SM. Frequency of CYP2C9 and VKORC1 gene polymorphisms and their influence on warfarin dose in Egyptian pediatric patients. Paediatr Drugs. 2014;16(4):337-341. Yin T, Miyata T. Warfarin dose and the pharmacogenomics of CYP2C9 and VKORC1 - rationale and perspectives. Thromb Res. 2007;120(1):1-10. Cavallari LH, Perera MA. The future of warfarin pharmacogenetics in under-represented minority groups. Future Cardiol. 2012;8(4):563-576. Sconce EA, Khan TI, Wynne HA, Avery P, Monkhouse L, King BP, et al. The impact of CYP2C9 and VKORC1 genetic polymorphism and patient characteristics upon warfarin dose requirements: proposal for a new dosing regimen. Blood. 2005;106(7):2329-2333. Gaikwad T, Ghosh K, Shetty S. VKORC1 and CYP2C9 genotype distribution in Asian countries. Thromb Res. 2014;134(3):537-544. Tabatabi M, Monfaredan A, Bargahi N. CYP2C9 gene allelic variation and the required dose of warfarin in patients with a history of thrombosis in North West of Iran. Med J Tabriz Univ Med Sci. 2012;2(34):75-80 (In Persian). Shalia KK, Doshi SM, Parikh S, Pawar PP, Divekar SS, Varma SP, et al. Prevalence of VKORC1 and CYP2C9 gene polymorphisms in Indian population and its effect on warfarin response. J Assoc Physicians India. 2012;60:34-38. Kimura R, Miyashita K, Kokubo Y, Akaiwa Y, Otsubo R, Nagatsuka K, et al. Genotypes of vitamin K epoxide reductase, γ-glutamyl carboxylase, and cytochrome P450 2C9 as determinants of daily warfarin dose in Japanese patients. Thromb Res. 2007;120(2):181-186. Zhao F, Loke C, Rankin SC, Guo JY, Lee HS, Wu TS, et al. Novel CYP2C9 genetic variants in asian subjects and their influence on maintenance warfarin dose. Clin Pharmacol Ther 2004;76(3):210-219. Zand N, Tajik N, Moghaddam AS, Milanian I. Genetic polymorphisms of cytochrome P450 enzymes 2C9 and 2C19 in a healthy Iranian population. Clin Exp Pharmacol Physiol. 2007;34(1- 2):102-105. Vorob’eva NM, Panchenko EP, Dobrovol’skii AB, Titaeva EV, Khasanova ZB, Konovalova NV, et al. Polymorphisms of genes CYP2C9 and VKORC1 in patients with venous thromboembolic complications in Moscow population: effects on stability of anticoagulant therapy and frequency of hemorrhage. Ter Arkh. 2011;83(6):59-65. Yoon YR, Shon JH, Kim MK, Lim YC, Lee HR, Park JY, et al. Frequency of cytochrome P450 2C9 mutant alleles in a Korean population. Br J Clin Pharmacol. 2001;51(3):277-280. Nakai K, Habano W, Nakai K, Fukushima N, Suwabe A, Moriya S, et al. Ethnic differences in CYP2C9*2 (Arg144Cys) and CYP2C9*3 (Ile359Leu) genotypes in Japanese and Israeli populations. Life Sci. 2005;78(1):107-111. Gu Q, Kong Y, Schneede J, Xiao YB, Chen L, Zhong QJ, et al. VKORC1-1639G>A, CYP2C9, EPHX1691A>G genotype, body weight, and age are important predictors for warfarin maintenance doses in patients with mechanical heart valve prostheses in southwest China. Eur J Clin Pharmacol. 2010 Dec;66(12):1217-1227. Yang JQ, Morin S, Verstuyft C, Fan LA, Zhang Y, Xu CD, et al. Frequency of cytochrome P450 2C9 allelic variants in the Chinese and French populations. Fundam Clin Pharmacol. 2003;17(3):373-376. Vargens DD, Damasceno A, Petzl-Erler M-L, Suarez-Kurtz G. Letter to the Editor: Combined CYP2C9, VKORC1 and CYP4F2 frequencies among Amerindians, Mozambicans and Brazilians. Pharmacogenomics. 2011;12(6):769-772. Burian M, Grosch S, Tegeder I, Geisslinger G. Validation of a new fluorogenic real-time PCR assay for detection of CYP2C9 allelic variants and CYP2C9 allelic distribution in a German population. Br J Clin Pharmacol. 2002;54(5):518-521. Aynacioglu AS, Brockmoller J, Bauer S, Sachse C, Guzelbey P, Ongen Z, et al. Frequency of cytochrome P450 CYP2C9 variants in a Turkish population and functional relevance for phenytoin. Br J Clin Pharmacol. 1999;48(3):409-415. Lam MP, Cheung BM. The pharmacogenetics of the response to warfarin in Chinese. Br J Clin Pharmacol. 2012;73(3):340-347. Baniasadi S, Beizaee S, Kazemi B, Behzadnia N, Shafaghi B, Bandehpour M, et al. Novel VKORC1 mutations associated with warfarin sensitivity. Cardiovasc Ther. 2011;29(4):e1-5. Salehifar E, Farhadi F, Janbabai Gh, Ahangar N. Frequency of VKORC1 gene polymorphisms and its association with warfarin dose requirement in patients from mazandaran province. J Mazand Univ Med Sci. 2012;22(94):44-52. Tabatabi M, Monfaredan A, Bargahi N, Oskouyi S. Evaluate the frequency polymorphism 1639 G> A gene VKORC1 in patients with cardiovascular disorders in North West of Iran. Arak Med Univ J. 2013;15(4):40-6 (In Persian). Hadjipanagi D, Chrysanthou S, Voskarides K, Deltas C. Genetic polymorphisms in warfarin and tacrolimus-related genes VKORC1, CYP2C9 and CYP3A5 in the Greek-Cypriot population. BMC Res Notes. 2014;7:123-126. Lund K, Gaffney D, Spooner R, Etherington AM, Tansey P, Tait RC. Polymorphisms in VKORC1 have more impact than CYP2C9 polymorphisms on early warfarin International Normalized Ratio control and bleeding rates. Br J Haematol. 2012;158(2):256-261. Steimer W, Zöpf K, von Amelunxen S, Pfeiffer H, Bachofer J, Popp J, et al. Allele-specific change of concentration and functional gene dose for the prediction of steady-state serum concentrations of amitriptyline and nortriptyline in CYP2C19 and CYP2D6 extensive and intermediate metabolizers. Clin Chem. 2004;50(9):1623-1633. Scibona P, Redal MA, Garfi LG, Arbelbide J, Argibay PF, Belloso WH. Prevalence of CYP2C9 and VKORC1 alleles in the Argentine population and implications for prescribing dosages of anticoagulants. Genet Mol Res. 2012;11(1):70-76. Owen RP, Gong L, Sagreiya H, Klein TE, Altman RB. VKORC1 pharmacogenomics summary. Pharmacogenet Genomics. 2010;20(10):642-644. Bodin	L, Verstuyft C, Tregouet DA, Robert A, Dubert L, Funck-Brentano C, et al. Cytochrome P450 2C9 (CYP2C9) and vitamin K epoxide reductase (VKORC1) genotypes as determinants of acenocoumarol sensitivity. Blood. 2005;106(1):135- 140.